Noble Master Developer's Blog » URGENT: Doomsday Agents Wanted! Noble Master Games has been approached by Dr. Lazarus, a time traveler from the future. Under Dr. Lazarus’s leadership, we have setup a global network to monitor and deactivate doomsday events. We are in urgent need of agents. 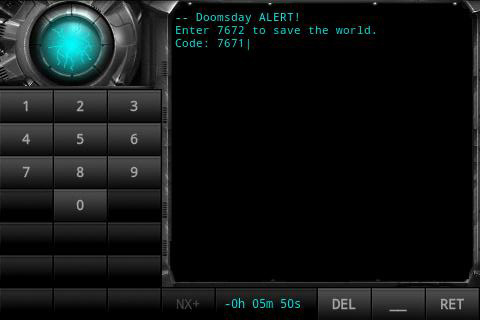 Please download the Doomsday Deactivator from the Android Market to save the planet from ultimate destruction. I am Dr. Lazarus from the Secret Service of the country of Lichtenstein. I have traveled back in time to setup a global network to stop the destruction of this planet. Your services are needed to enter doomsday deactivation codes in timely matter to save this planet. Apply to become an agent NOW! dr c aschwanden? more like dufus c aschwiper, aaaaaaaaaaaagh! Doomsday Deactivator is no master piece, that’s for sure!